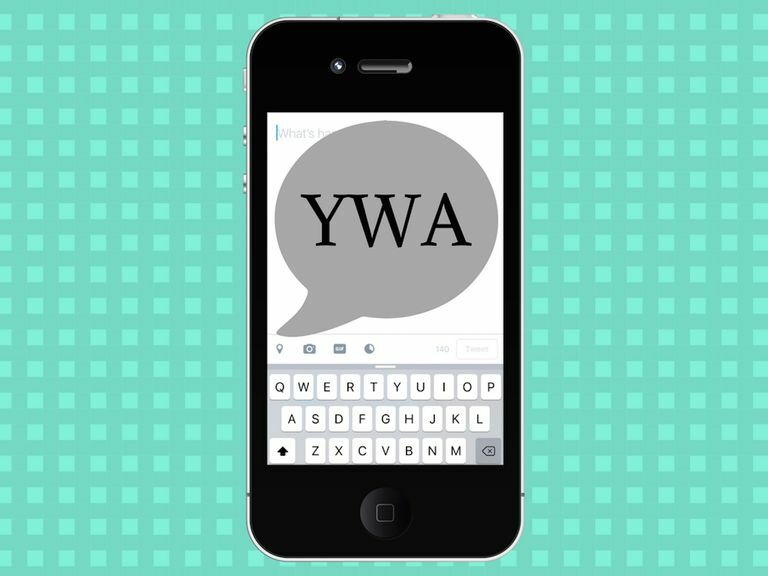 YWA is a rare online acronym. If you happen to spot it online or in a text message, you'll want to know what it means so you can respond in the right away. The acronym stands for You're Welcome Anyway. YWA is a variation of YW, which stands for You're Welcome. Despite their similarities, the acronyms are often used in different ways. A person typically uses YWA when they feel inclined to acknowledge some form of help or generosity that they offered toward someone else who failed to acknowledge it first. The word "anyway" is tacked onto the end of this acronym to emphasize the fact that the helpful/generous person expected the receiving person to be grateful rather than ignore them or keep the text message conversation centered on themselves. When someone says YWA, it can result in a variety of responses. It might make a person aware of their thanklessness and trigger them to actually backtrack and respond thankfully. On the other hand, the use of YWA might trigger a person to respond negatively if they themselves don't think they should have to be thankful. It could also simply lead to a change of subject or be used to mark the end of the conversation. Friend #1: Hey, I got us a pecan pie for dessert because it was on sale!" Friend #2: "I don't like pecans." Friend #2: "No biggie. Thanks tho." In the first example above, you get to see a positive turnout from the use of YWA in a conversation. Friend #1 is the helpful/generous person while Friend #2 is the one who's oblivious to their own thanklessness — instead choosing to focus on their own problem (a.k.a not liking pecans). Friend #1 thinks that their help and generosity deserves to be acknowledged and responds with YWA. Friend #2 then notices Friend #1's use of YWA and is made aware of their own thanklessness, seen by their choice to say thank you in the end. Friend #1: "Did you find out if you got in trouble for handing in your assignment late?" Friend #2: "Nope :) I passed!" Friend: #1: "Well, ywa for saving your grade by handing it in for you during the night class." Friend #2: "Or maybe I did such a good job that it just deserved a good grade..."
In the second example above, you get to see how the use of YWA can turn a conversation sour by triggering a negative response. Friend #2 is completely focused on they're own good fortune and totally ignores the fact that it was because of Friend #1's help that they had a positive experience. Friend #1 responds with YWA to remind them of it, but Friend #2 clearly doesn't think they have to be thankful to Friend #1 for their help and chooses to respond to their YWA comment with another selfish comment. Friend #1: "Sent you the pics from last night." Friend #2: "Too bad my storage is full and can't save them until I purge my photos." In the final example above, you get to see how the use of YWA results in something neutral. The acronym is used in a much more casual sense to end the conversation or switch the subject. YW is almost always used as a polite response to someone else who says "thank you" (or TY — the corresponding acronym). YWA, on the other hand, is used when a thank you was expected but didn't happen. The difference really is whether a "thank you" was involved. When someone says "thank you" or TY, use YW. It's as simple as being courteous when interacting with others. When you help someone but they don't say "thank you" or TY and you think they should have, use YWA. Be prepared for different responses depending on context and the relationship you have with the other person/people. You might expect others to respond positively by helping them realize that they forgot to say thank you when in fact you might just trigger them to retreat further into themselves with a negative response.